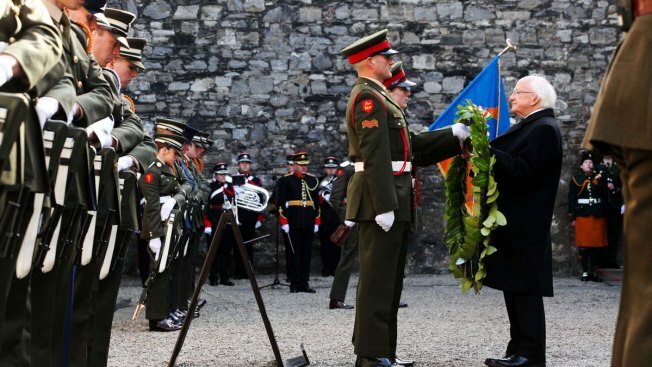 Irish President Michael D. Higgins (R) receives takes a wreath to lay at a ceremony at Kilmanham Gaol in Dublin on March 27, 2016 as part of the program of commemorative events to mark the 100th anniversary of the Easter Rising. Thousands of soldiers are marching solemnly through the streets of Dublin to commemorate the 100th anniversary of Ireland's Easter Rising against Britain, a doomed rebellion that reduced parts of Dublin to ruins and inspired the country's eventual independence. Sunday's five-hour parade through the capital features military ceremonies at key buildings seized in Easter 1916, when about 1,200 rebels sought to inspire a popular revolt against Ireland's place within the United Kingdom. British forces, initially caught off guard, rallied troops and a river gunboat that forced the rebels' surrender within six days. Many Dubliners opposed the insurrection, but public sentiment swung heavily in the rebels' favor once British Army commanders in Dublin decided to execute 15 rebel leaders by firing squad. Surviving Easter rebels led Ireland's 1919-1921 war of independence.